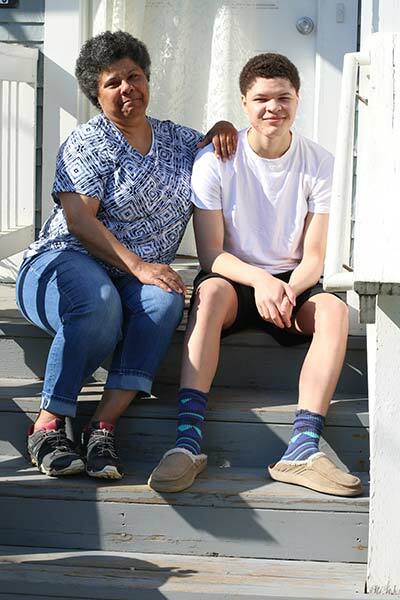 Leila Gavros, 59, and her grandson Ra’Shaun, 16, soak up sun on the steps of their Northeast Portland home. Gavros started caring for Ra’Shaun when he was 2 months old and is one of a growing number of grandparents raising grandchildren. Gavros shows off a picture of Ra’Shaun. Despite many of the challenges involved in parenting a second time around, she sees the opportunity as a gift. They neither planned for it nor asked for it. The responsibility sprung from heartbreak, and they knew the outcome would be messy. But when John and LaVonne Doherty’s daughter died from drug use, leaving two young children, they didn’t hesitate. The Dohertys, members of Holy Redeemer Parish in North Portland, are among nearly 25,000 grandparents in Oregon, and 2.7 million nationwide, who are raising grandchildren, according to census figures. Their ranks are increasing; the number of grandparents stepping into parental roles is up 7 percent from 2009. Experts say the trend likely will continue given the opioid and heroin epidemic and growing number of incarcerated women. Public as well as church-sponsored support for “grandfamilies” depends on the state or diocese, but “on the whole, additional resources are needed,” said Jaia Peterson Lent, deputy executive director of Generations United, a Washington, D.C.-based nonprofit that supports and advocates on behalf of intergenerational families. The challenges for grandparents raising grandchildren — physical, financial, emotional, legal — mean the decision is nearly always an act of profound love. Leila Gavros, 59, started caring for her grandson Ra’Shaun when he was 2 months old. One of her daughters had been involved with gangs, the notorious Bloods and Crips, and abused drugs and alcohol. “She was out of control,” said Gavros, sitting in her modest Northeast Portland home with family photos overlapping on the mantelpiece and a garden in the backyard. After a brief period of stability, her daughter was raped. “It was a terrible time, Gavros recalled. The 16-year-old later became pregnant and gave birth to a son in 2000. The teen was unable to care properly for the infant, and Gavros said she “stood up against some serious gang members” to keep her grandson safe. She eventually gained custody through the foster care system, and following a three-year, emotional process, she adopted Ra’Shaun. “It wasn’t in my game plan to take care of a baby, but I love my grandson, I love my daughter; there was no question what I’d do,” said Gavros, echoing the Dohertys’ resolve. The financial strain of raising a child unexpectedly can be a major burden for grandfamilies, especially given one-fifth of grandparents raising grandchildren have incomes below the poverty line, according to census data. “Some grandparents might be living on a fixed income, and you hear of others spending down their retirement to pay for expenses or save for college,” Lent said. The level of financial support grandparents receive depends on their legal arrangement and state. When relatives are first licensed foster parents and then adopt, like Gavros, they generally receive an adoption-assistance rate. “It’s not much,” according to Gavros. It covers a few items her grandson might want. “I don’t count it in the budget,” she said. While Gavros opted for adoption, the Dohertys — who also raised a third granddaughter whose mother has struggled — are court-appointed guardians. They receive assistance for their grandchildren’s medical expenses. She worked as a cashier at Home Depot, but often had to give up shifts to attend court appointments and parenting classes as she worked toward adoption. She’d used cloth diapers to save money and planted a garden to supplement their diet. In spite of the financial obstacles, Gavros managed to complete her bachelor’s degree through night classes and now works as a paraeducator in Portland Public Schools. 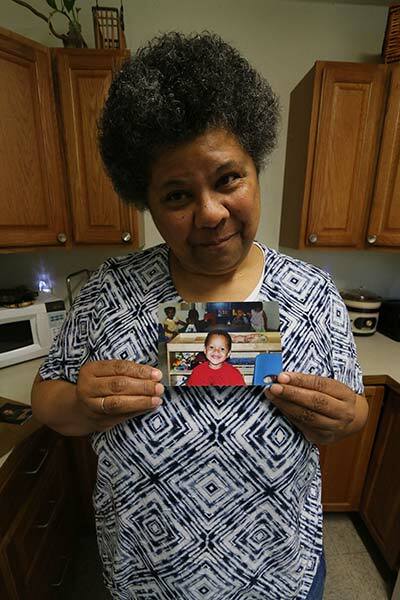 She volunteered in Ra’Shaun’s classes for years, “to make sure he was doing OK,” and after extensive research sent her grandson to St. Andrew Nativity School in Northeast Portland for middle school. John and LaVonne Doherty — who’ve been married 52 years and are active in Worldwide Marriage Encounter, a faith-based marriage enrichment program — commend individuals such as Gavros who raise grandchildren solo. Health issues and less stamina can add physical obstacles to parenting the second time around. Gavros has Type 2 diabetes and two years ago was hospitalized due to complications from the disease. Overall, LaVonne and John’s health has been good, but “you don’t have the energy like when you were younger,” said LaVonne. Their parish community, Worldwide Marriage Encounter friendships and faith in God buoyed John and LaVonne as they raised their grandchildren, now 16, 20 and 23. Two have attended De La Salle North Catholic High School in Portland. “We would not be able to do any of what we have done without our belief in God and without support from our parish,” said LaVonne. John acknowledged, however, that additional support for grandfamilies would be helpful, especially for those who don’t have a strong network like they’ve had. For many grandparents, there’s a sense that they are on a long, hard journey in isolation, said Loriann McNeill, who coordinates family caregiver support programs for Multnomah County. McNeill has been running retreats for grandparents raising grandchildren for more than a decade, which Gavros and the Dohertys attended and found valuable. The National Family Caregivers Support Program, established in 2000 and administered by the U.S. Department of Health and Human Services, funds local aging services, such as those coordinated by McNeill. The federally financed program allocates 10 percent of funds for supporting older relatives raising families, but “unfortunately, a lot of states are not aware of these funds,” according to Lent. In Oregon, monies are put to good use through a number of programs and resources, including a comprehensive guide for grandparents and other relatives raising children in the state. Like the Dohertys, Catholic grandfamilies turn to their parish communities as they navigate child-rearing. But across the country there also are a number of diocesan- and archdiocesan-affiliated programs that step in to help, including Catholic Charities initiatives in Boston; Hartford, Connecticut; the Diocese of Kansas City-St. Joseph, Missouri; Denver and Washington state. Some programming is similar to the Kinship Integrative Network, a program of the Catholic Family Center of the Diocese of Rochester, New York. The network links grandparents to support around parenting, completing financial aid forms and navigating legal issues. It also offers a parent support group with a focus on parenting a second time around. The family center additionally operates a statewide kinship navigator, linking grandparents to services based on their location. The majority of dioceses and archdioceses, including the Archdiocese of Portland, don’t offer official programs for grandfamilies specifically, though standing ministries provide varying levels of support. Heather Zarrilli, director of Family Support and Counseling Services at Catholic Charities of Oregon, said some grandfamilies may find the agency’s adoption and counseling services or its parenting classes helpful. The Portland archdiocesan Marriage and Family Life Office offers an array of material on marriage, family and faith life, “which grandparents raising grandchildren can draw from,” said Jason Kidd, director of the office. Their website contains general information for grandparents, including links to the U.S. Conference of Catholic Bishops' website. Kidd also hopes to compile resources specifically for grandfamilies. On a recent afternoon, Gavros and Ra’Shaun sat together on the stoop of their house while Gavros goofed around in the sunshine. Like countless teens before him, the 16-year-old was embarrassed slightly by the adult’s antics. Yet the love between the feisty grandmother and gangly adolescent was hard to miss. Grandparents are quick to share how their second chance at parenting is a gift, despite the difficulties. “It’s given me a chance to see the mistakes I made with the ones I gave birth to, to step back and do it a little differently this time,” said Gavros. Gavros said raising her grandson has “made me more aware of my life and of the world, especially since I’m raising a black male.” She said the fears she has for him have made her more politically active. “Having children around draws you out of yourself, keeps you on your toes,” she said. A half-day event will provide information on community resources and a chance to meet other grandparents raising grandchildren and feel supported. June 8, from 9:30 a.m. to 2:30 p.m., at Gethsemane Lutheran Church, 11560 SE Market St., Portland. To register: 503-348-3633. The retreat is sponsored by the Multnomah County Family Caregiver Support Program of the Aging, Disability and Veterans Services Division and the Jessie F. Richardson Foundation. A GrandRally will be held May 10 in Washington, D.C., hosted by Generations United and the AARP, among others. The event will be livestreamed, and virtual rallies will be held across the country. For more information, click here. Great story Katie This comment has been hidden due to low approval.